WINDY HILL Jack and Jill Mills in Sussex (Photo: David Blaikie). THEY all said I was mad. Every Miller in England told me there would be no wind in August. If I was expecting the sails of their mills to be turning when I arrived in the languid late summer with a camera crew, I’d be wasting my time. But I’d already scheduled a month’s worth of filming between Lincolnshire and Sussex, crisscrossing the country in search of some of England’s most treasured surviving windmills, in places where I’d just assumed there would be plenty of wind, all year round. So I just sat on this wisdom quietly, because I’d already promised delivery of a one-hour program in time for Christmas. If it was going to happen, the footage needed to be in the can and edited by the end of September at the outside. Our packed itinerary started close to home in the Cambridgeshire fen lands, where, on arrival at Wicken Fen drainage mill (managed by the National Trust), the little green canvas-covered sails of the smock mill were ripping around at a very pleasing pace. Thinking that I’d struck the one day of late summer wind, I got cameraman Alan James to film just about everything we could see that was moving in the gale. The next day we had two interviews scheduled. Ideally, I wanted windmills turning gently in the background. Apparently, they could be cranked around by hand, so at least I had that option up my sleeve if there was no wind. First subject was Nigel Moon, Miller at Whissendine Mill in Rutland, who scratched his head when we turned-up as agreed, saying he couldn’t credit why the wind was blowing so well for the time of year. As we embarked, the crew noticed something very interesting about wind. When the sun comes out from behind a cloud, it brings with it a thermal gust strong enough to get a windmill’s sails turning, making a pretty picture behind the interviewee. But for a film crew, bright sunlight means the interviewee will be over-exposed. A sudden gust of wind is also hazardous for sound recording. The crew handled this frustrating situation with great skill and patience. We all became instant weather watchers, recording only during the passing of very large, long clouds. At Green’s Mill, right in the city of Nottingham, Miller and writer of our documentary, David Bent, took us through the entire workings of one of England’s best-preserved windmills. We quickly completed every bit of filming that didn’t require turning sails, so I let the crew go for lunch. Meanwhile, I climbed up into the tower mill, surrounded by its fascinating internal workings, all so beautifully wrought from timber, stone and iron. Out on the balcony, where the Miller would set the sails on his mill, there was not a trace of wind. Had my run of weather-luck finally come to an end as predicted? Ever-hopeful, I climbed higher again, to see tiny windows looking over the courtyard where the crew lunching far below. UNHORSED BY WINDMILLS I felt a little like Don Quixote. The pressure of the quixotic plan to bring my first full-length documentary in on time and budget was now palpable. I’d hitched my reputation to something as fickle as the weather, an energy I already had a love-hate relationship with. The realisation struck me with a feeling of anger and desperation, so I did something I rarely do … I prayed! After a few resigned moments looking at the view, the noise of one of the large timber-toothed cogs inside the mill caught my attention. I watched it, oblivious for a few moments to what its movement meant. A shadow slid across the small room from the window, and I realised the sails outside were turning. I shouted out the window to the crew and got them back on deck within a minute. Across a nicely windy afternoon we got all the shots we needed. After a great night’s sleep we headed north into Lincolnshire. With its endless skies capturing as much wind as any Miller would ever want off the North Sea, Lincolnshire was surely designed to harness wind power. With its sleek black tower, the six-sailed Sibsey Trader Mill (stewarded by English Heritage) rises above the flat landscape like something straight out of Tolkien. I half expected to see Saruman stalking the wrought-iron balcony. Alford’s beautiful five-sailed Mill put on a brilliant show for the camera. This tower mill was the first operating windmill where we saw windmill-ground flour for sale, and the point of the whole windmill revolution sank in. In the summer of 1996, food was still fighting for attention in the midst of the media’s gardening and home renovating revolution. Operating mills, which had once been the centre of every town’s economy, were lucky to have survived the industrial revolution and the invention of the supermarket. At many of Lincolnshire’s mills, the seeds of the current paddock-to-plate movement had well and truly sprouted. Wrawby Post Mill was the next quintessential timber post mill in our Lincolnshire leg, where the Miller kindly acquiesced to my requests for him to catch a ride on one of his mill’s sails for our documentary’s historical recreations. The majestic span of the mighty eight-sailed Heckington Mill at Sleaford was turning so fast we were able to get excellent shots of the internal workings of a windmill without the essential (but not that attractive) caging required to prevent visitor injury. In the heat and noise within the cap of a working windmill we got a great sense of the dangers that mill workers endured. Hundreds of timber teeth wait to capture every bit of loose clothing and each stray finger. David Bent had researched some macabre extracts from The Stamford Mercury, relating the terrible deaths of Millers in centuries past. Once harnessed, wind power can be every bit a life-threatening as electricity. We’d been warned by more than one Miller to watch out for low-passing mill sails, which are often so quiet they’re easy to forget about, as they come rushing up behind you. We reached the south of England in a more confident mood, and climbed the path to film the stunning Halnaker Mill in West Sussex, high on a wild hill where every blade of grass was bent by the wind. The Clayton Mills on the South Downs are also beautifully situated on a hillside, which is why they got their names “Jack” and “Jill” mills. 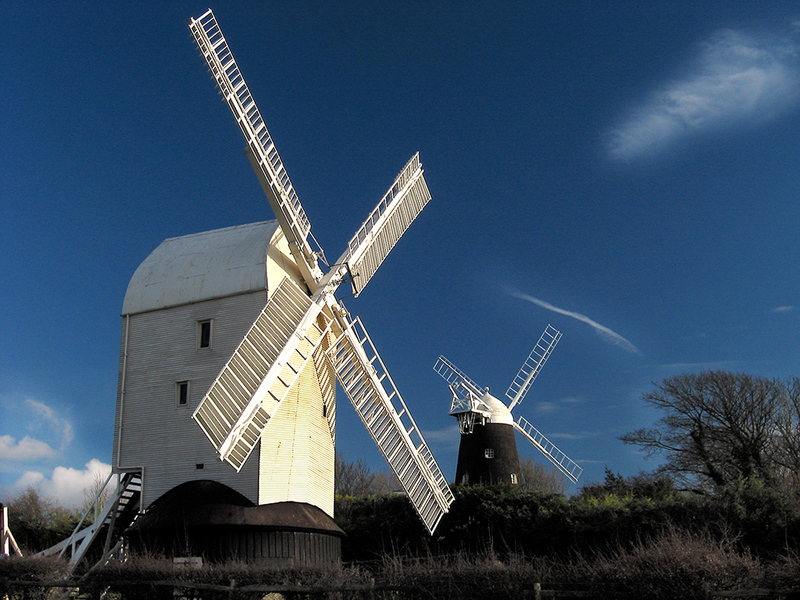 Like the Union Mill in the beautifully preserved town of Cranbrook in Kent, Sussex’s upland mills show the prominence that windmills had in most townscapes during the era when wind power was the major source of energy. By the time we got home to Suffolk, every mill that was capable of having its sails turned by the wind was captured in motion. My sense of achievement helped in tilting-at a great voice for the documentary’s narration, so I approached Janet Suzman’s agent. I arrived at the recording studio more than a little nervous. She just stepped out of a cab, rolled up her sleeves and dived-in, instantly capturing the feel I’d anticipated for the commentary, and in her character readings of those gruesome northern newspaper reports. Maybe it was beginner’s luck, but since the making of Seven Centuries of the English Windmill, whenever I’ve been faced with outdoor location filming and performances, I have quietly invoked whatever spirit answered my weather prayer inside Green’s Mill in Nottingham. I’ve also become an advocate for wind turbines, because wind power has a longer, cleaner and cheaper track record than any other human-created power harnessing method we’ve ever mastered. No wonder it’s considered so controversial as it makes its comeback. 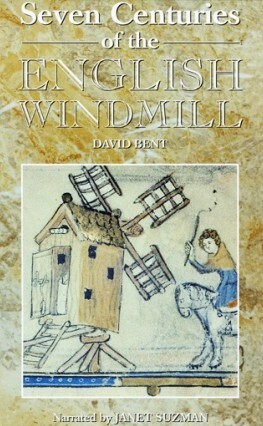 Seven Centuries of the English Windmill is distributed on DVD.